Will Philly's Alvarez be next up for McGregor after UFC 202 result? 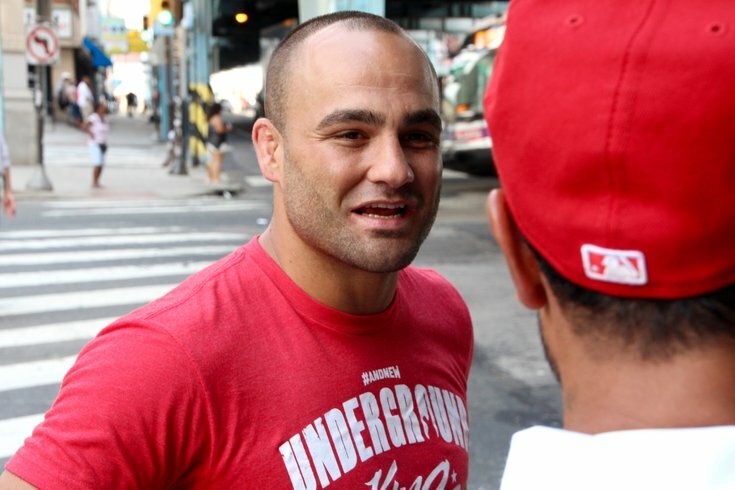 Immediately after beating Rafael Dos Anjos for the UFC lightweight title last month, Eddie Alvarez was already hopeful that his first title defense would come against Conor McGregor -- not because the latter is arguably the biggest star in the sport, but because the new champ thought Dana White and Co. owed him an easy fight after three straight wins over some of the best in his weight class. When Alvarez met up with PhillyVoice in Kensington, his old neighborhood, a few weeks back, the North Catholic grad was eyeing a November fight at Madison Square Garden against the winner of Saturday night's UFC 202 main event between McGregor and Nate Diaz (20-11). Currently, the featherweight champ, McGregor (19-3) had lost to Diaz via a second-round submission in his most recent bout back in March after moving up to welterweight. This time, however, McGregor won a bloody five-round majority decision over Diaz. One thing that could prevent Alvarez-McGregor from happening is if UFC opts for a third fight between McGregor and Diaz, meaning Alvarez (28-4) would likely have to face someone like top lightweight contender Khabib Nurmagomedov (23-0) or perhaps Donald Cerrone (30-7), who moved up to welterweight and earned a win over Rick Story at UFC 202.. But in order for a rematch to happen, Diaz will have to fight the featherweight champ -- McGregor wants the next fight in his old weight class. "If you want this trilogy, it's on my terms," he said after the win. "I came up to 170, now you'll come back to 155 and we'll finish what we've started. I knew what I had to do this time around and I did it." Of course, after the loss, Diaz could be hesitant to drop down to a weight for which McGregor is better suited. And even if Diaz turns down the fight, Dana White has previously said that after the rematch McGregor would return to defend his featherweight title. But if not, the reigning lightweight champ will be ready and willing to take on McGregor at 155 pounds. It's too soon for any official decisions to be made, but there's also nothing official standing in the way -- at least not yet. Stay tuned as we'll have more as soon as that changes.